Dr. Jack Hopkins provided strong leadership in support of many of the major projects developed by the Council of Michigan Foundations during the years of his tenure at the Kalamazoo Community Foundation (formerly the Kalamazoo Foundation). The Kalamazoo Community Foundation is a founding member of CMF with a history of leadership. Dr. Hopkins furthered this commitment by offering his formidable leadership skills in assisting with the implementation of statewide projects that represented a bigger vision for the field as a whole. He was deeply engaged as a representing community foundation member, and then as a board member for CMF. 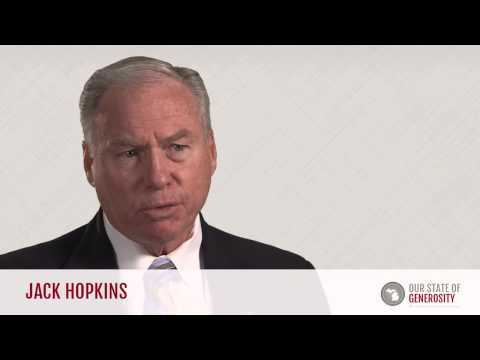 Dr. Jack Hopkins talks about his career in philanthropy. Dr. Jack Hopkins talks about the challenges and successes of the Michigan Community Foundations Tax Credit. Dr. Jack Hopkins talks about how the Council of Michigan Foundations (CMF) created a philanthropic culture of "we're all in this together." 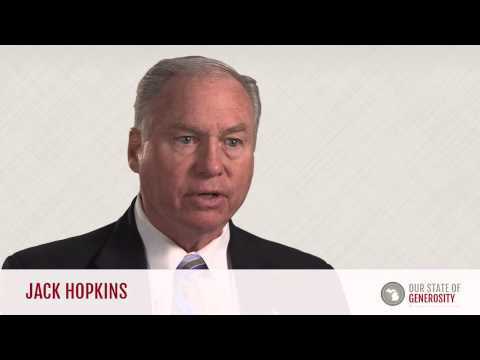 Dr. Jack Hopkins talks about Russ Mawby's incredible leadership style. 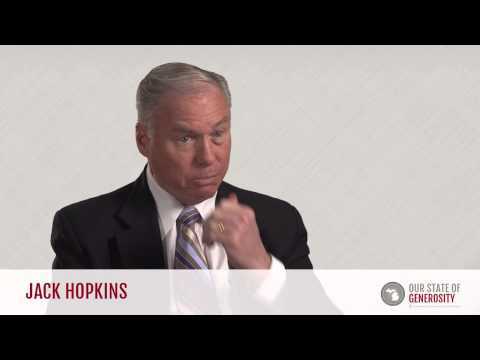 Dr. Jack Hopkins talks about lessons learned from Robert Greenleaf's book "The Servant as Leader." Dr. Jack Hopkins talks about how the Kellogg Foundation's partnership with the United Way promoted youth philanthropy and later the Michigan Tax Credit. Dr. Jack Hopkins talks about the adoption of the Foundation Information Management System (FIMS) by the Kellogg Foundation. Dr. Jack Hopkins talks about how the Branding Project caused 60-year old community foundations to change their names for the betterment of all foundations. 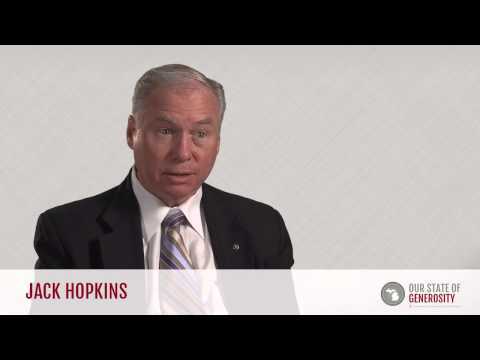 Dr. Jack Hopkins talks about how important building permanent endowments has been to the mission of the Council of Michigan Foundations (CMF). 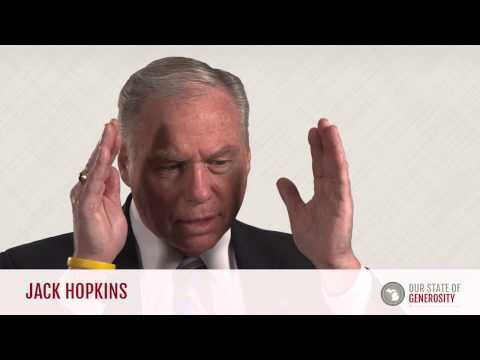 Dr. Jack Hopkins graduated from Marietta College in Ohio with a Bachelor of Arts in speech and theater. While there, he participated in both the forensic and theater programs, and won the competitive Jewett Prize for excellence in oration skills. Following his graduation from Marietta College, Dr. Hopkins pursued both a Master of Arts degree and a Doctor of Philosophy degree at Ohio University studying interpersonal and organizational communication, with minors in radio/television and journalism. While working toward his doctoral degree, he was offered an instructorship in the College of Communication. 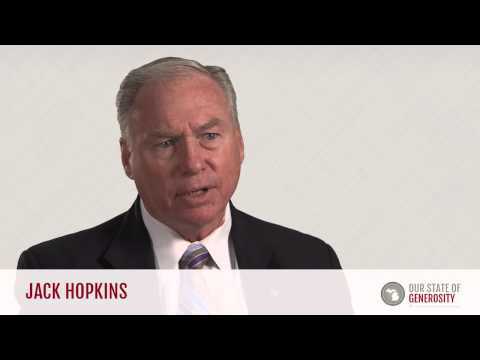 Growing up, Dr. Hopkins’ father worked at the White House as a civil servant for 40 years, and his mother was involved in the community through the Girl Scouts and her church. However, he does not view himself as having a background of volunteerism and philanthropy during his childhood. Instead, he identifies his time spent in higher education as his introduction to the field of philanthropy. After receiving his Ph.D., Dr. Hopkins joined the faculty of the newly formed communications team at Hope College, and soon became its chairman. After fostering growth in that department, he was hired by Nazareth College, where he served in a variety of positions for eight years, ending as its president/CEO. This time in higher education taught him how to fundraise, as well as introduced him to many foundations that had helped to fund some of the college’s programs. Dr. Hopkins worked at the Kalamazoo Community Foundation for 25 years, during which time the foundation played a leadership role in many statewide projects. This was due in part to the substantial assets of the foundation, serving a relatively small community, and the willingness of Dr. Hopkins and his board to take risks while supporting other foundations in their ideas and endeavors. During the 25 years that Dr. Hopkins was with the Kalamazoo Community Foundation, its assets grew from approximately $38 million to $300 million, and in 2008, it was among the largest three community foundations in the country on a per capita basis. One example of this aspect of his leadership was the introduction of the Foundation Information Management System (FIMS). The FIMS project aimed to create a single computerized system for Michigan’s community foundations. Despite the fact that his chief financial officer did not want to switch to FIMS, Dr. Hopkins saw value in working in partnership with the Council of Michigan Foundations, which had taken the lead on implementing FIMS at the rest of the major community foundations in Michigan. He felt that without the Kalamazoo Community Foundation’s backing, the project would fail and so the foundation supported and adopted the system. FIMS, funded under the leadership of Dr. Joel J. Orosz, then program director in charge of the Philanthropy and Volunteerism programming area at the W.K. Kellogg Foundation, was ultimately a success thanks to the hard work of many across the state. As another example of his leadership, Dr. Hopkins brought the idea of the tax credit for community foundation gifts to the Council of Michigan Foundations. He championed this idea to its successful conclusion, helping to negotiate the various challenges involved in passing major tax legislation. Another project in which the Kalamazoo Community Foundation sacrificed its own interests for the betterment of the field was a rebranding effort among community foundations. To support this initiative, the Kalamazoo Foundation (which it had been called for 60 years) renamed itself the Kalamazoo Community Foundation. Beyond his work at the Kalamazoo Community Foundation, Dr. Hopkins spent considerable time engaging with the state infrastructure organizations. He acted as a board member and later vice-chair of the Council of Michigan Foundations, a position he had left previously to become the chair of the leadership team at the national Council on Foundations at a time of considerable unrest among community foundations at the national level. 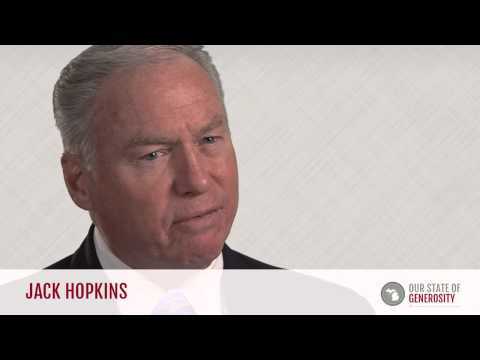 Similarly, Dr. Hopkins served on the Midwest Community Foundation Ventures’ board before acting as its chair, and was a member of the community foundation committee for the Council of Michigan Foundations. Dr. Hopkins was interviewed regarding his insights and experiences in working with Michigan’s philanthropic community and the Our State of Generosity (OSoG) partners. The following are selected quotations from his interview specifically related to the five organizing themes of the OSoG project.